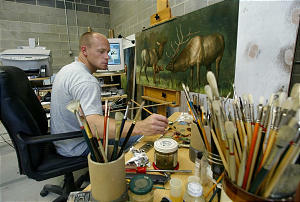 Joseph F. Brickey is an award-winning artist who employs the classical form and composition of the old masters. He was born on June 11, 1973, in a family of twelve children. Prior to serving as a full-time missionary to Brazil for The Church of Jesus Christ of Latter-day Saints, he studied chemical engineering at Brigham Young University. After he completed his mission, he switched his major to art and earned his Bachelor of Fine Art in illustration. He continued his studies in various schools throughout the United States and Europe and earned his MFA from the New York Academy. 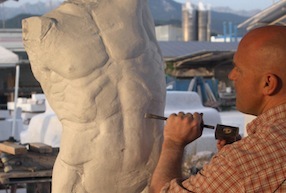 He won the Grand Central Academy sculpture competition and was awarded a marble sculpting fellowship to Carrara, Italy. 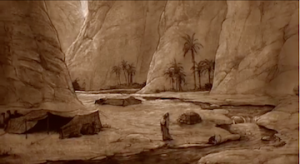 Many of his works are religious, based on scripture and the life of Joseph Smith. Many of his works are seen in LDS Visitors’ Centers and temples, including the Campinas Brazil and the Copenhagen Denmark, some of which he completed while serving as a Church service art missionary. 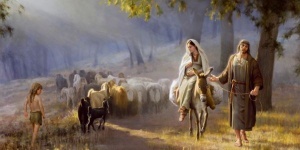 He has produced art books for Deseret Book, including When Jesus Was Born in Bethlehem. Brickey lives in Provo, Utah, with his wife and four children.